Is it better to do one or two channels well, or spread thinly across lots of platforms? Will results be different? Maybe someone would be kind enough to contribute an artistic rendering, as we saw in the SMUG seal development (which will soon come to fruition.) If so, I will update this post with that graphic. Microblogging is the base, both because it’s easiest to start and because you should have more “servings per day” of this than any of the subsequent levels. Here I’m thinking Twitter as the main choice, but within your enterprise you may want to use something like Yammer for employee-only conversations. Like the USDA pyramid’s base, 6-11 “servings” of Twitter per day is probably a good target, particularly if you are interacting in conversations instead of just pushing out information. It’s a great tool for networking with those who may share your organization’s interests, but with whom you don’t yet have an online relationship. Social Networking is the next level up, and here I’m using Facebook as the example. A Facebook “fan” page for your organization taps into a potential user base of more than 200 million and enables richer interactions that go beyond 140 characters. This might have a Recommended Daily Allowance (RDA) of 4-5 servings per day, as you could post links to news releases, or add upcoming events, or upload photos or video, for example. Balanced use even within the Facebook platform is advisable: if you send Updates several times a day, you’ll quickly turn off your “fans” unless what you have to share is extraordinarily compelling. Trust me: it’s not. Web Video. The platform of choice here is a YouTube channel, because it’s free and it’s the world’s second-largest search engine. You need to have some source of video, which is what puts this a little higher on the pyramid, because you’ll need to spend at least $150-$200 for a video camera. But having the ability to upload video that can be found on its own on YouTube, emailed or tweeted to interested folks or embedded in Facebook or your blog greatly extends your reach. The RDA is 1-2 “servings” but with a camera like the Flip that has a built-in USB port for uploading, this is reasonable. And even if you don’t make that target, putting up even a couple per week is a good start, assuming you have something to say. Blogs. These are at the SMUG Pyramid’s peak. They provide multimedia platforms for embedding video, slideshows and photos as well as a venue for longer, more reasoned arguments (like this post.) They’re at the peak because they require greater commitment, and because fewer organizations have taken this step. While Ed Bennett’s Hospital Social Networking List contains 253 hospitals with Twitter accounts and 174 with Facebook and YouTube, only 31 have blogs. Yet a blog is where you can have, in Paul Harvey’s phrase, “The rest of the story.” You can tweet a brief message and then include a shortened link that sends people to your blog for fuller explanation and discussion. Unlike Facebook, your blog is available to anyone with a Web browser, with no membership required for full access. You should have at least one post (or serving) per blog per week to keep it fresh, but more frequent is better. Here is an example of a post I did on our Sharing Mayo Clinic blog, in which I embedded an interview with a patient, Tom Vanderwell, who I met via Twitter. We’re also friends on Facebook, which shows how the tools all work together. The SMUG Social Media Pyramid answers the question that arose in the #hcsm chat by giving both a prescription for a well-balanced social media diet and a progression to get there. Don’t feel like you need to be involved in every platform, particularly at first. Start with Twitter (because it’s easy) and then probably with Facebook, if for no other reason than to keep someone else from claiming your organization’s name. The only investment is your time. 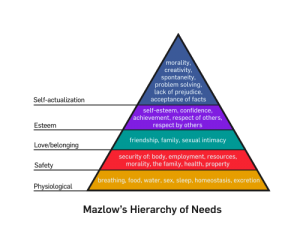 As you grow in comfort and capability, and as others in your organization join you in the effort, you can then move to the higher levels of the pyramid. What do you think of the SMUG Social Media Pyramid? Does it make sense to you? Do you see other essential “food groups” for social media that I’ve omitted?